Green People Organic Children Berry Smoothie Conditioner is a strengthening complex of plant oils and protein promotes tangle-free, silky soft hair. Gentle on your children`s hair and scalp. This product is suitable for children who may be prone to eczema and psoriasis. 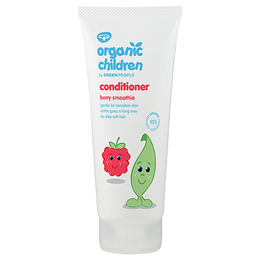 Be kind to your child`s skin with this gentle, natural conditioner. This product is made with 89.1% certified organic ingredients. A natural `no-tangle` conditioner with smoothing Plant proteins. Strengthening complex strengthens strands and promotes silkiness. Fruity Raspberry, Apple and Vanilla aroma smells good enough to eat. Super gentle on delicate hair and scalps. Green People Organic Children Berry Smoothie Conditioner - 200ml. Aqua, Cetearyl Alcohol, lecithin, Olea Europaea Fruit Oil*, Helianthus Annuus Seed Oil*, Levulinic Acid , Aloe Barbedensis Leaf Juice Powder*, Rosemarinus, Officinalis Leaf Extract* Triticum Vulgare Gluten, Sodium Cetearyl Sulfate, Olus Oil, Aroma [Caprylic/Capric Triglyceride, Rubus Idaeus Fruit Extract, Vanilla Planifolia Fruit Extract, Aniba Rosaeodora Wood Oil, Salvia Sclarea Oil, Michelia Champaca Flower Extract, Ananas Sativus Fruit Extract, Pyrus Malus Frit Extract, Rosa Damascena Extract, Osmanthus Fragrans Flower Extract, Citrus Aurantium Bergamia Fruit Oil], Potassium Sorbate. Apply to wet hair and leave for 1 minute. Rinse thoroughly. Below are reviews of Green People Organic Children Conditioner - 200ml by bodykind customers. If you have tried this product we'd love to hear what you think so please leave a review. Green People Organic Children Berry Smoothie Conditioner is a strengthening complex of plant oils and protein promotes tangle-free, silky soft hair. Gentle on your children`s hair and scalp.